As a follow-up to my December climb of Lascar, I climbed Cerro Toco last week. 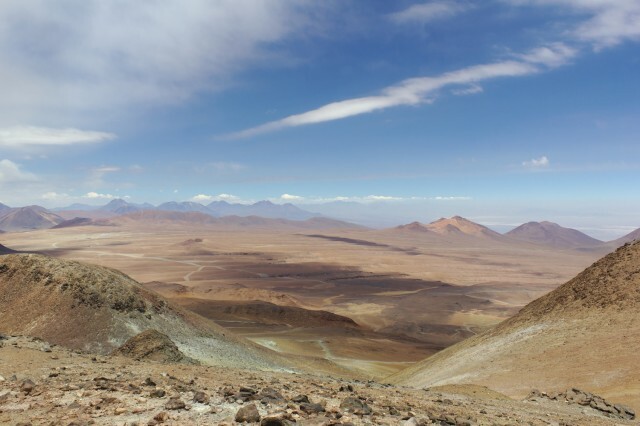 The 5604 m tall dormant / extinct volcano is slightly taller than Lascar, but the climb has about half the vertical gain, so it’s easier. As I’m currently working on a telescope situated on the slopes of Toco, the climb was somewhat obligatory. 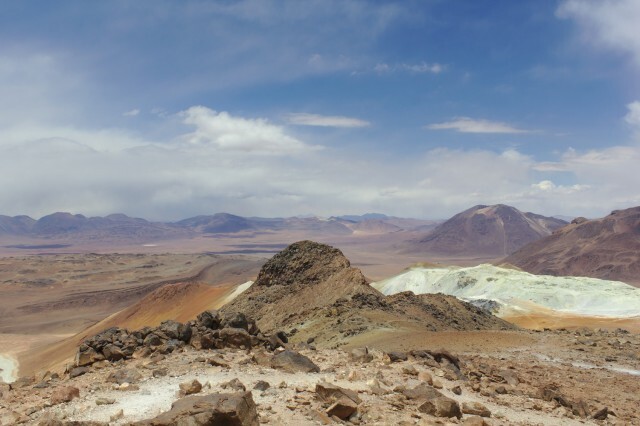 The mountain, and the telescopes on it, is located within the Parque Astronómico Atacama. 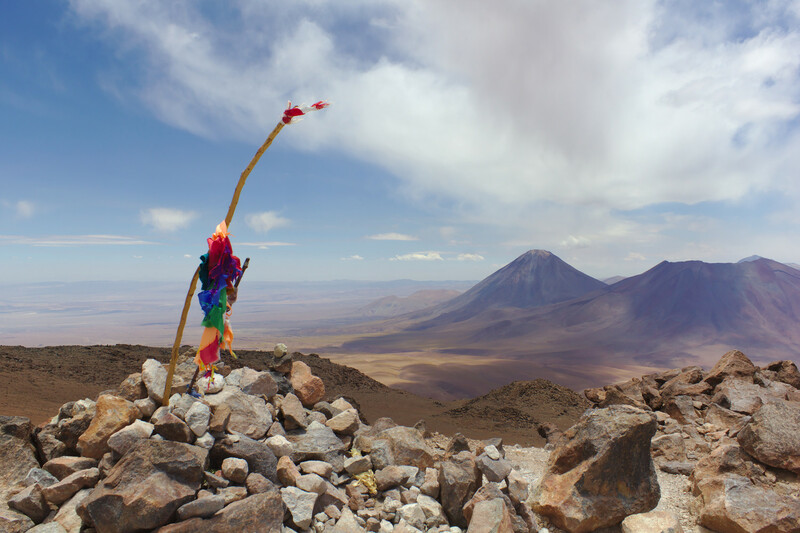 Leaving from San Pedro de Atacama, one gets to the trailhead by taking the Paso Jama road (CH 27) towards Argentina. There is then a turnoff for an unpaved road just after kilometer 35, which takes one up the mountain to the trailhead, which is located just past Toco’s three cosmology experiments. The trail is easily visible from the road. Driving past the trailhead allows one to see Toco’s abandoned sulfur mine. The trail to the summit is easy to discern. It does split in a few places, but as long as one keeps heading towards the summit, it is difficult to become lost.1 An elevation profile derived from my GPS track is below. 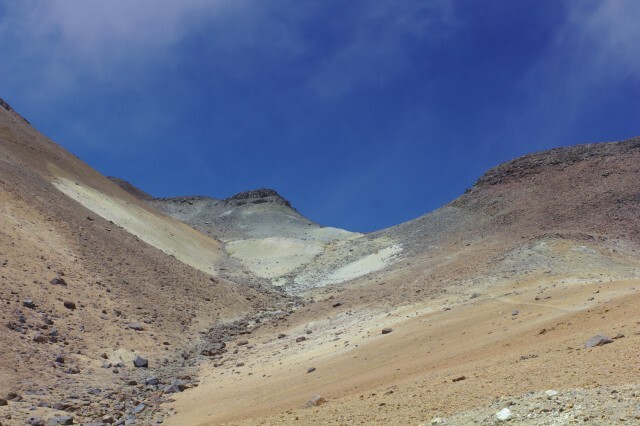 It is approximately 1.7 km to the summit, with around 360 m of vertical gain (average grade of 22%). Round-trip, the climb took a little over two hours. From the summit, one has an excellent view of Licancabur, Juriques, and Boliva to the north; Argentina to the east; and ALMA to the southwest. This entry was posted in Exploring and tagged Cerro Toco, Chile, climb, hike, mountain, volcano. Bookmark the permalink. We will try to go there in April 2017. Do we need 4-wheel-drive or can we make it with an ordinary car? The same question about the visit of the telescopes around Toco? You’ll definitely need four wheel drive for both. Hi Matthew – Thanks for the notes. If we only have time for one hike and we are physically fit (and will be acclimatized), which do you recommend for the best views – Lascar or Toco? Thank you! The views from both mountains are excellent. Toco is closer to San Pedro and is an easier hike, but the drive to Lascar is much more scenic. Between driving to Lascar, climbing, and driving back, it takes most of a day, while the same can be done with Toco in a morning, so it really depends on how you want to plan things. I wonder if climbing Toco is possible in late June? What are the temperatures, and are there problems with snow and driving due to it? That depends on whether or not you’re lucky; sometimes it’s fine, but sometimes it’s completely snowed out and inaccessible. The daytime high temperature is generally slightly below freezing.